Almost the same as the other E-ones on Schiphol. This one has the same pump capacity. There is although one exception. This one has a large nozzle on top. With this nozzle they can penetrate an airplane and start fighting fires in the inside. Added by Prof. Femi Olaleye on 17 August 2006. 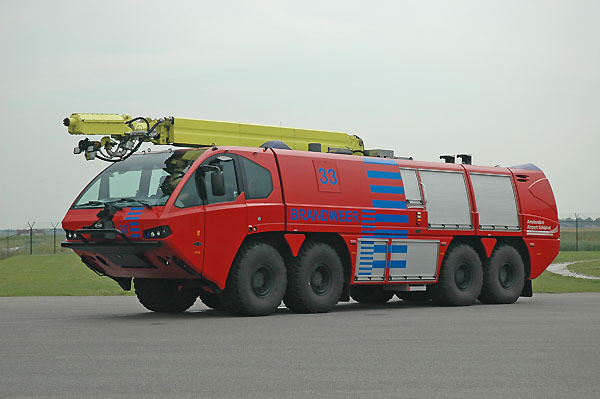 Although, fire feels hot, fearful and deadly, fire fighting vehicles do not also have to look dreadful. Probably, designers can have a rethink like this one. Added by Professor Femi O. Olaleye on 08 September 2006. The ugliest thing i've ever had the misfortune to see. Its Horrible! Added by Briantwigley on 04 February 2007. The nozzle which can penetrate the plane is known as Snozzle.Some FD in U.S. use the Snozzle for municipal firefighting and also industrial firefighting. Added by Bomba995 on 05 February 2007. If I was in an aircraft in trouble I wouldn't care what it looked like provided it could do it's job. Added by Andrew Wright on 05 February 2007.